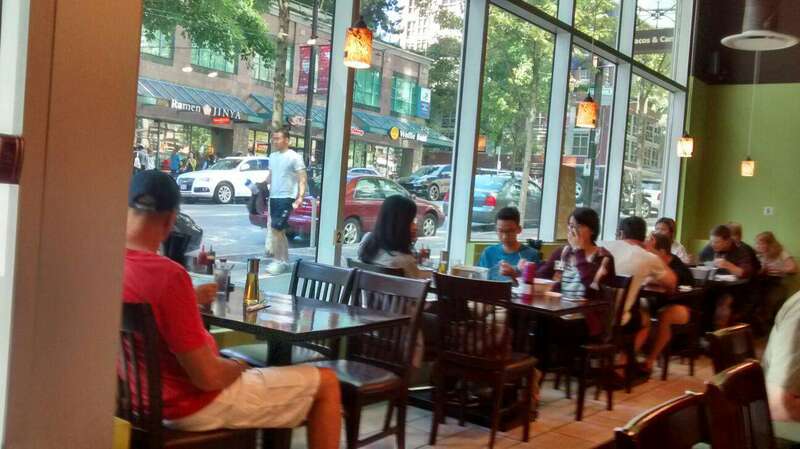 Stopped in with family to try out some Pho in Vancouver. We had tried a few places that seemed to be lined up on a Friday afternoon for lunch. 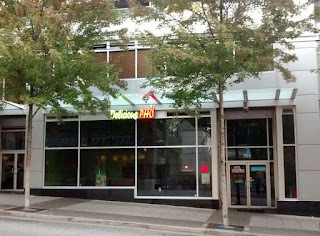 With a small, but bearable line-up we chose Delicious Pho (255 Robson Street, Vancouver). 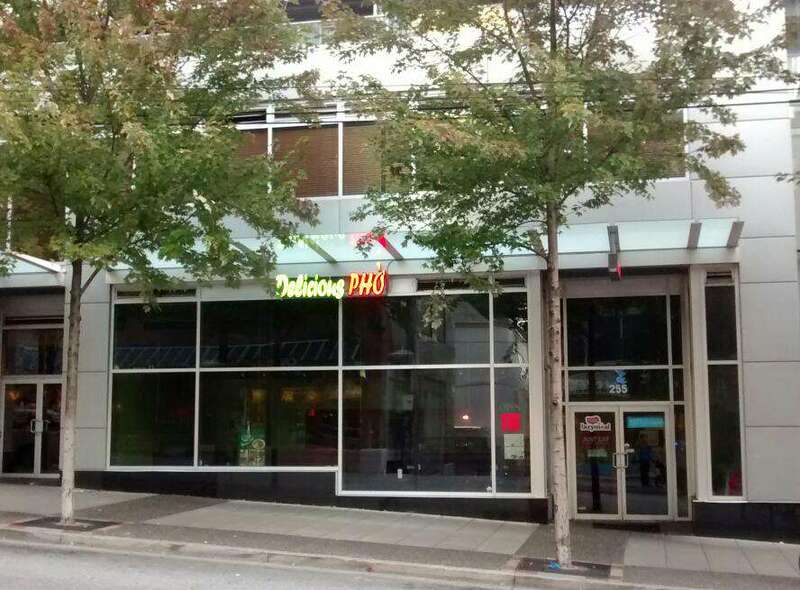 Delicious Pho, located mere steps away from BC Place, is a medium sized restaurant with a modern interior painted in a spring leafy green. Upon entering, if there is a wait, customers are requested to add their names and number of people in their party themselves to a dry erase board. The problem though is the dry erase board is only viewable if you are looking out the window as opposed to entering the store. So many customers miss this and staff, periodically stopping by to fill tables, constantly remind people to put their names on it. Perhaps a small sign on the wall just above the first tables nearest the entrance might help resolve this issue. We were seated within ten minutes of entering, adding our names and waiting to be seated. I perused the menu and then ordered with a wait staff member. Delicious Pho's Interior overlooking Robson Street. The Order: 1 Beef Ball and Rare Beef Pho and 1 BBQ Chicken Sandwich. Like most Asian restaurants, tables really don't have a set waiter or server. Instead, once needing service, someone at the table raises their hand or otherwise signals to one of the roving employees to venture forth to address the issue. The food took a respectable ten minutes to arrive at the table after ordering. 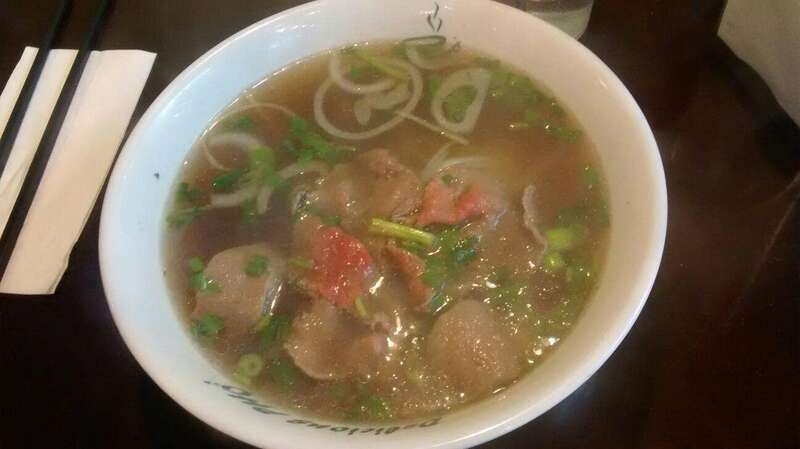 The Pho was a little different than what I was used to. Sure there was the usual rare beef and beef balls in decent quantities along with the noodles. But the broth was an interestingly beefier broth and darker in colour than normal. Nothing wrong with this rendition, just a little different from most others. As for quantity? I was decently full on a small bowl. The BBQ Chicken Sandwich was an interesting Vietnamese sandwich itself. My only prior try of Vietnamese sub sandwiches was at Ottawa's Co-Cham. So this was going to be interesting. 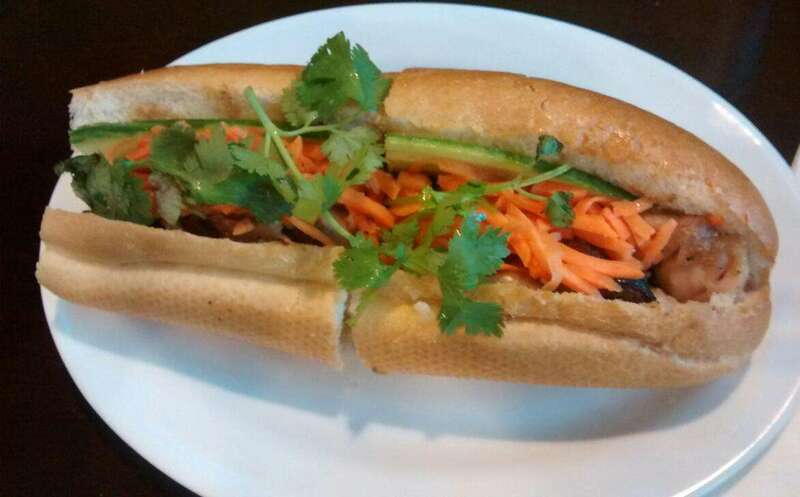 The Delicious Pho sandwich was served on a regular white french bread with BBQ'd chicken, shredded carrot, a type of unidentifiable sauce to may palate and other garnishes. A nice tasting sandwich about the equivalent of a regular 6" sub in size for $4.50. Service at Delcious Pho is pretty good most of the time. Like most Asian restaurants with the service by committee set up, there is sometimes a lag of when someone is available to take your request instead of responding to others. So be patient as sometimes it can get pretty busy. Overall, Delicious Pho is a satisfactory modern style Asian restaurant with decent pricing and decent portion sizes. Staff move fairly quickly to clean tables and get you seated as fast as possible. When in Vancouver, I may return!